Eliott Trencher, Vice President, is an associate portfolio manager and a U.S. real estate securities research analyst covering the health care, office and industrial sectors. He has 13 years of investment experience. 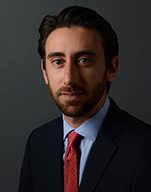 Prior to joining the firm in 2008, Mr. Trencher was a real estate analyst with Goldman Sachs. Previously, he held internships at Newmark & Co. Real Estate and Cushman & Wakefield. Mr. Trencher has a BA from New York University. He is based in New York.